This year's event is being held under the motto “Cycling culture moves” and will put a spotlight on cyclists, themselves. The goal of the summit is to shift the focus from infrastructure, technology and administration to humans on bicycles. We will provide inspiration for the establishment and improvement of vibrant cycling cultures in cities and municipalities across Europe. The European Cycling Summit 2018 will host a wide variety of keynotes, panel discussions, paper sessions, interactive formats and an exhibition area. Moreover, excursions and an attractive social program will be offered to delegates. Have a look at the varied program (at https://cyclingsummit.zgis.at/en/program/) and secure your personal ticket at the cycling summit here (at https://cyclingsummit.zgis.at/en/registration/)! Furthermore you have the chance to take part in the video and photo competition (at https://cyclingsummit.zgis.at/en/contribute/ )or present your portfolio in the exhibition area (at https://cyclingsummit.zgis.at/en/expo-en/). 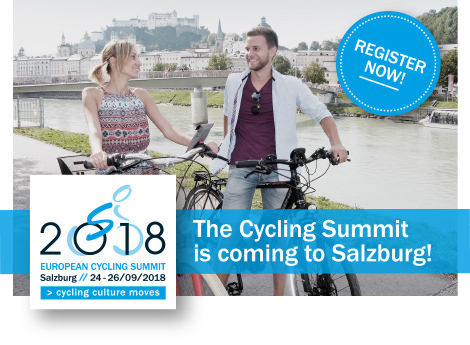 The European Cycling Summit 2018 is the main event this year in a series of Austrian cycling summits, happening annually. International speakers and delegates are invited to Salzburg under the auspices of the Austrian EU presidency. This year, the summit is hosted by the city and the province of Salzburg in cooperation with the Federal Climate Protection Agency, klimaaktiv mobil from the Austrian Ministry of Sustainability and Tourism, and the Austrian Ministry for Transport, Innovation and Technology.